Overview: Old friends reunite to reattempt a legendary pub crawl. Universal Pictures; 2013; Rated R; 109 Minutes. Partaking of a Liquid Repast: For all of its outlandish comedic exploits, for all of its zany science fiction plot twists, and for all of its out-of-this-world elements of cinematic magic, it’s quite astonishing to realize that, in the most evident sense, The World’s End is a movie that catches us on the hook of personal empathy, somehow baited by familiar human experience. To say that Director Edgar Wright pulls “a trick” to accomplish this empathic investment from his audience is to undervalue what the filmmaker has accomplished in this film and its predecessors in the Three Flavours Cornetto trilogy. Wright is an artist of nearly countless tricks, and it is a blissful viewership experience to fall for each and every one of them. But specific praise needs to be given to the “bait and switch” brilliance displayed as this movie moves from exposition to conflict. The “Golden Mile” is just a standard local pub crawl legend, but presented by the screen and the washed up, sympathetic, once-cool Gary King (Simon Pegg), it becomes a tempting challenge for the viewer. I have talked about this movie at great length with a number of people, and I can’t recall many instances in which that discussion didn’t move to, “Could you finish the Golden Mile?” The movie begs the viewer to ask that question (I could, just as an aside, and I could double back). The strong initial impulse is for the viewer to imagine his or her closest friends taking the challenge, making the same trip. Gary, Andy (Nick Frost), and friends become stand-ins for real people, beloved through performance and assumed familiarity. It’s here that the film has you, and you are taking the trip, but you’re making affective pit stops that you never expected. Smashy Smashy Egg Man: Along the way, the onscreen friends navigate a virtual carnival built from Wright’s most prominent talent: amalgamation of synchronous genre learnedness, genre homage, genre satire, and genre subversion. Like Hot Fuzz and Shaun of the Dead before it, The World’s End builds from the best parts of iconic genre movies an equally if not more enjoyable movie. 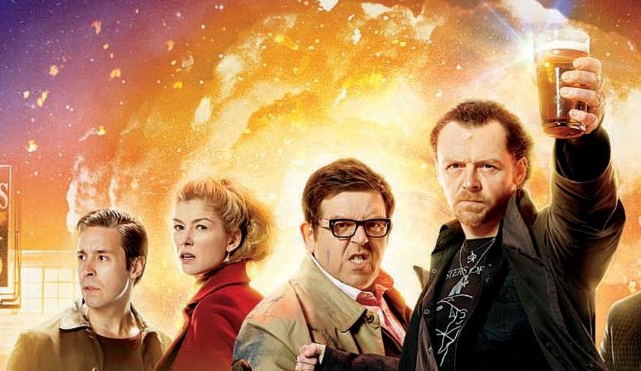 The World’s End is a comedy that offers the biting wit of Monty Python standing against a more intelligent version of Adam Sandler or Will Ferrell’s man-child. The razor sharp retorts are in balance with clever stupidity, missed punchlines, and physical slapstick within an all encompassing map of modern humor. The World’s End is also a sci-fi thriller, a drunk descendant of Invasion of the Body Snatchers and the Twilight Zone Episode “Monsters are Coming to Maple Street.” And, most astonishingly, The World’s End is an action film with the most joyfully-conceived, gleefully choreographed, and expertly framed fight scenes from any movie of the last two decades that isn’t in The Raid series. The World’s End is all of these things, yet it never steps on its own uncountable feet; it is a graceful and comfortable dance from start to finish. Let’s Boo-Boo: On my initial watch, when the closing chapter moves to an inverted pulpit allowing a drunk Gary King to stand next to his rediscovered best friend Andy and confusingly espouse some inebriated righteousness about free will to the thunderous alien consciousness above, I was a little worried. It felt a bit hokey, a bit too weighted with hollow social philosophy to summarize the three very personal and affective journeys that Pegg and Frost (both underrated screen presences who found perfect homes in this series) have piloted viewers through over the last decade. But then comes the epilogue. Frost sits with his family in a rebuilt post-apocalyptic society, and Gary King leads a group of android companions into a rickety old bar in a ruined version of the Old West, where he announces his presence with intent to fight just before the credits roll. That pairing of images offers the ending that Frost and Pegg deserve, the ending that Wright and his fans deserve, and the ending that this trilogy–the most inventive and film-informed trilogy of all time–deserves. Because really, it’s just the beginning and promise of more movies. What more could we ask for? Straight Outta Compton, Straight Into Oscar Contention?